The Democratic Republic of Congo government is looking into whether to allow oil exploration in two protected wildlife parks, Virunga and Salonga. 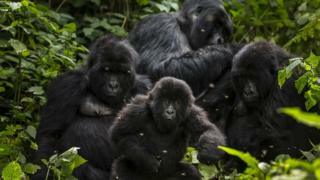 Around one-fifth of Virunga national park could be opened to oil drilling. Both parks are Unesco World Heritage Sites, with Salonga national park covering 36,000 sq km (13,900 sq miles) of the Congo Basin - the world's second-largest rainforest after the Amazon. The government has defended its right to authorise drilling anywhere in the country, saying in a statement that it is mindful of protecting animals and plants in the two parks. The cabinet said it had approved commissions charged with looking into whether to declassify parts of the parks, including 1,720 sq km (664 sq miles), or 21.5%, of eastern Congo's Virunga, the continent's oldest wildlife reserve. Correction 2 July 2018: This story has been changed to make it clear that the commission will decide whether oil drilling should be allowed. We initially reported that oil drilling had already been allowed.